7 million kids will have toys under the tree this Christmas thanks to the efforts of Toys for Tots and Dlyte and Is Supported By VidzMedia 's Smart Video Embed Technology. Marine Toys for Tots Foundation and digital fundraising platform Dlyte announce their second annual partnership to help put toys under the tree for more than 7 million kids this holiday season. The two will be using a new fundraising campaign, Give While Giving, designed to help fill a gap when it comes to raising much-needed money during the holiday season (and throughout the year). “We are very pleased to partner with Dlyte again this year as a corporate partner," said (Ret.) Maj. Bill Grein, Vice President, Marine Toys For Tots Foundation. “With their generous support and unique fundraising platform, we will be able to fulfill more Christmas and holiday dreams of many less fortunate children, who otherwise might be forgotten this year." Give While Giving utilizes Dlyte’s Shop. Earn. Give. fundraising platform. Throughout the year, when TFT supporters purchase gift cards from their favorite restaurants and retailers through Dlyte, up to 30% of their purchases are automatically donated to Toys For Tots. During the holidays, the Give While Giving campaign allows supporters to donate to TFT every time they send an e-gift with Dlyte. This means every time supporters shop or send gifts with Dlyte they’re helping Toys For Tots without spending a penny more. Last year, Toys For Tots distributed 18 million toys to 6.8 million less fortunate children. IN 2015, Dlyte successfully raised significant funds for groups like the Wounded Warrior Project, USA Luge, ASPCA, CEED, Special Olympics and many others. Dlyte projects the 2015 holiday season to be even more successful in bringing in extra money for nonprofit organizations because of their new iPhone and Android Apps that allow supporters to shop and send gifts on the go. 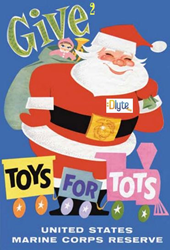 To kick off this year’s Give While Giving program, Dlyte will be donating $10 when a Toys For Tots supporter signs up and sends a gift with Dlyte. The Marine Toys for Tots Foundation is a not for profit organization authorized by the U.S. Marine Corps and the Department of Defense to provide fundraising and other necessary support for the annual Marine Corps Reserve Toys for Tots Program. Now in its 68th year, Toys for Tots provides joy and a message of hope to economically disadvantaged children through the gift of a new toy during the Christmas holiday season. Their gifts offer these children recognition and a positive memory they will cherish for a lifetime. Many of the gifts they provide, such as books, games and sports equipment, make a significant contribution to the educational, social and physical development of these children. In 2014, Marines distributed gifts to 6.8 million children in 759 communities nationwide. The Marine Toys for Tots Foundation relies on individual donations from the American public as well as support from corporate sponsors. For more information, visit http://www.toysfortots.org. About Dlyte™: Dlyte’s goal is to enable $1Billion in giving over the next 5 years. Dlyte is a fundraising platform that helps causes raise money by harnessing the retail spending power of their supporters. Causes earn up to 30% when supporters buy gift cards with Dlyte’s Shop. Earn. Give. program. Dlyte’s Retailers Include, But Are Not Limited To:., Amazon.com, Applebee's International, Inc., Albertson's, American Airlines, 1-800-Flowers.Com, Inc, Barnes & Noble, Inc., Bass Pro Shops, Brookstone, Bubba Gump Shrimp Co., Cabela's Incorporated, Caribou Coffee, Chart House Restaurant, Champs Sports, Chili's, Crutchfield, Cvs Pharmacy, Domino's Pizza, Foot Locker Retail, Inc., Gander Mountain Sports, Gamestop, Gap, Gilt Groupe, Groupon, Inc., Golfsmith, Inc., Home Depot, itunes, J. C. Penney Company, Inc., Kmart, L L Bean, Marshalls, Mccormick &, Schmicks Seafood & Steaks, Morton's Steakhouse, Old Navy, Omaha Steaks, Overstock.Com, Inc., Overton's, Panera Bread Inc., Papa John's, QVC, Rainforest Café, Red Robin Gourmet Burgers, Inc., Regal Cinemas, Staples, Inc., Sephora Usa, Inc., Sports Authority, Starbucks, Texas Roadhouse, TGI Fridays, The Gap, Tom Thumb, TJ Maxx, Walmart And Xbox. DLYTE™ Brand Partners Are Continuously Being Added To Further Expand Consumer Options And Fundraising Efforts.